Bishop Noel O’Regan SMA installed as bishop of Ndola, Zambia. 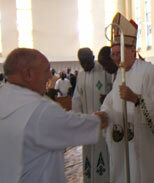 Bishop Noel O’Regan was installed as the fourth bishop of the Catholic diocese of Ndola on Saturday 13 November 2004. The installation followed from his appointment of the 1st October 2004. The attendance was very large with the result that a big number of people were unable to gain entry into the cathedral. Archbishop Orlando Antonini, the Pro-Nuncio to Zambia, conducted the installation of Bishop Noel during a prayerful liturgy attended by many dignitaries of Church and State. The Church dignitaries included Cardinal Adam Kozlowiecki, former archbishop of Lusaka, and the present archbishop of Lusaka, Medardo Mazombwe along with five diocesan bishops. Priests, religious and numerous laity from the dioceses of Ndola and Solwezi also attended. Many leaders of the different Christian churches were also in attendance. The Catholic diocese of Limburg, in Germany, which has a long association with the diocese of Ndola, was also represented. Fr John Horgan SMA, Vice-Provincial, represented the SMA Irish Province. 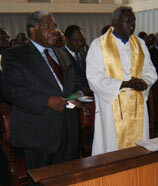 The President of the Republic of Zambia, Levy Mwanawasa, led the dignitaries of State who attended. Others prsent included Senior Chief Mushili, Chief Chiwala and several leading Zambia politicians. It was an occasion of joy and celebration. In the speeches bishop Noel was warmly welcomed by all. He was commended for his work as bishop of Solwezi and he was pledged good wishes and support for his future work in the diocese of Ndola. In reply bishop Noel pledged to carry on the work of the late bishop De Jong. All then enjoyed a celebratory meal at the Lowenthal Theatre and the Annex to the Cathedral house. On 14 November Bishop Noel began a busy week of familiarisation with the personnel, institutions and offices of his new diocese. We wish him God’s blessing in his ministry of leadership in this new and important assignment. Ndola Diocese is about 32,000 km2 in area and it has a population of about 2 million of which Catholics number about 750,000. There are 98 priests (of which 9 are SMA) and 302 religious working in the Diocese. Bishop O’Regan was born in Bishopstown, Cork in 1941. Having graduated from UCC in 1964 he became a permanent member of SMA in 1967. He was ordained to the priesthood in December 1967 at Newry, Co Down. He worked as a missionary in Zambia. He was appointed Bishop of Solwezi in 1995 and ordained bishop. He is to continue on as Apostolic Administrator of Solwezi diocese until a successor is named.